What is the Latest Dirty Water Rider? Congress wants to make it easier for fossil fuel companies, industrial producers, chemical manufacturers and other dirty industries to pollute and destroy wetlands and small streams, including the drinking water sources for 1 and 3 people. The House and Senate appropriations bills for Fiscal Year 2018 contain a dirty water rider to cut out your voice and limit your right to participate in government decision making by allowing Scott Pruitt’s EPA to ignore the law as it attempts to repeal Clean Water Act protections for vital water resources. Federal agencies are required by law to accept and consider public comments on proposed rules and regulations. When the Obama administration proposed the Clean Water Rule in 2014 itheld a 207 day comment period and met with more than 400 stakeholders. The public submitted more than 1 million comments, 87 percent of which supported the Clean Water Rule. EPA also reviewed more than 1,200 peer-reviewed scientific publications and confirmed a basic fact: small streams and wetlands impact water quality in larger streams and rivers downstream. If passed, this dirty water rider could allow EPA and the Army Corps of Engineers to ignore science and law and repeal the commonsense Clean Water Rule without public input. In summer 2017, more than 550,000 people (out of 660,000 total) commented in opposition to the proposed repeal of the Clean Water Rule. The Dirty Water Rider would let the Agencies ignore those comments. It could also interfere with Americans’ right to challenge the rule in court. 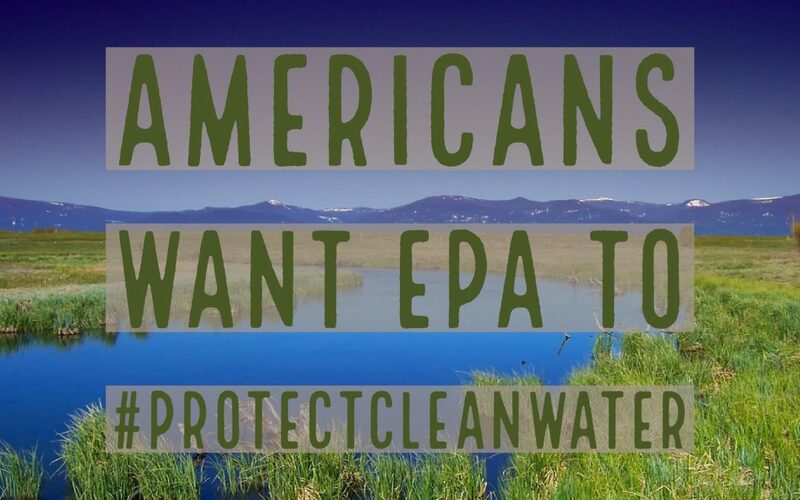 The Clean Water Rule is supported by science, law, and public opinion. But the Dirty Water Rider would let the Administration ignore facts and instead base its repeal on entirely fabricated claims of regulatory overreach. Don’t let this happen. This undemocratic dirty water rider will make it harder to hold our decision makers accountable for putting public health and our water at risk. Contact your Senators and Representative today. Tell them to reject the Dirty Water Rider and pass a clean spending bill. Learn more about the this Dirty Water Rider and others here.